One of the first questions people ask me about the martial arts I teach is “what’s your style?” Not, does it work, but what’s the type of martial art or the name of the style or system. I usually ask what they mean by ‘style’ so I can address their specific interest. I think the better question is whether a system of martial arts will work in a real-life attack. While some martial arts instructors have spent their lives studying one type of martial art from one specific ‘style,’ others have studied many types and styles. That is my background having studied and taught many types and styles of martial arts for more than 50 years. I studied Judo, Aikido, Japanese Karate, Kobudo, and Kung Fu as a teenager, and Tang Soo Do, Tae Kwon Do, Okinawan Karate-do, Kobudo, Kenpo, Kung Fu, and T’ai Chi Ch’uan as an adult. As for the specific styles I teach now my answer is Yon Ch’uan Martial Arts, 15 Animal Kung Fu, and Hwa Yu T’ai Chi Ch’uan. My primary instructor in all of those arts is Grand Master Robert Xavier. I have also studied with two of his senior students, Grand Masters Dave Maloy and Glenn Newth. I also study Okinawan Karate-do and Kobudo with Sensei Stephen Van Camp. I share this information with my students so they will understand that the training methods and self-defense techniques in our classes come from a variety of traditional martial arts systems that are based on “what works.” One of the benefits of studying many martial arts styles over a period of 50+ years is learning what works and what doesn’t. 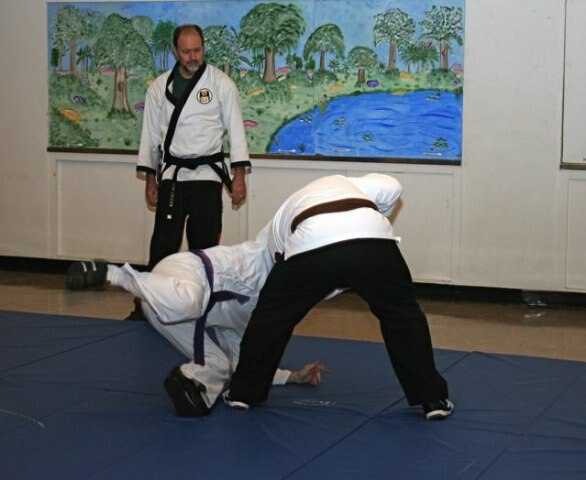 Techniques that don’t work in real self-defense situations can be easily dropped from the curriculum because there are so many effective techniques available from these martial styles. Earning a Black Belt in Yon Ch’uan Martial Arts and 15 Animal Kung Fu can take as long as seven to eight years, though some students are able to complete the requirements for 1st Dan in six years. Learning the “art” of martial arts should take several years of intense study in preparation for Black Belt testing. However, learning something that will help you defend yourself should take no longer than one or two classes. My goal in teaching self defense is that every student learn at least one thing in every class that they could use to their advantage if they were attacked leaving that class. While it may take months or years to develop the ability to deal effectively with a wide range of attacks from one or more people, it is my experience that people of all ages can learn basic self-defense skills in a short period of time. We could call this martial arts style the “style” of using whatever works to effect a safe escape from attack. The goal in the “whatever works” style of self defense is to avoid attack, but if attacked to escape in less than five seconds. The reason for selecting five seconds as the goal is that attacks that last longer than five seconds often result in injury to the person being attacked. That’s based on teaching scores of students who joined our class because they had been injured in attacks and learning about their experience, and viewing hundreds of real attacks and fights caught on video to better understand the attack and defense process. Instead of teaching students how to “fight,” we want them to evade attack and quickly escape to safety. Winning a fight is not our goal. Even experienced martial artists can be seriously injured in a fight, especially if the attacker has a weapon or friends. Our goal is evasion and escape. More about the style of “whatever works” in our next post.